CLEVELAND, Ga. – The White County Board of Commissioners had a full slate of agenda items to address at Monday’s work session and called meeting. 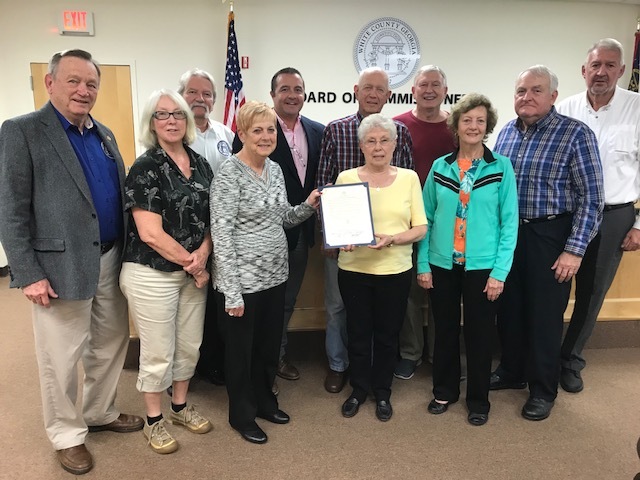 The first order of business was to read a proclamation in recognition of retired White County teachers and declare Nov. 4 as Retired Teachers Day in White County. Retired teachers who attended Monday’s meeting included Elaine McClean, June Collins, Martha Senkbeil, Judy Lovell, Tony Kemp, Frank Senkbeil, Lamar Collins. Commissioners held two public hearings. The first was to consider the application for a land use permit submitted by Todd Campbell to redistrict 3.2 acres located at 1617 Hwy. 115 East from Community Commercial District (C1) to Highway Business District (C2). Campbell would like to extend a parking lot to accommodate his used car lot. The second public hearing was to consider the application for a land use permit filed by Tina M. Della for 1.66 acres located at 373 Yonah Mountain Road. The proposed use is to place the property in a “Rent by Owner” program. The present use is Residential Single Family District (R1). Commissioners also discussed awarding contracts for animal control/veterinary services, senior services and scoreboards for ball fields at Mount Yonah Preserve. Public Safety Director David Murphy asked the board to approve a one year contract for veterinary services with VCA Chestatee Animal Hospital in Dahlonega. Murphy said that six request for proposal (RFP) had been hand-delivered to veterinary services and VCA Chestatee Animal Hospital was the only one that responded. The county has used a local veterinary service in the past, but was charged $108 to have the vet prepare the animal for adoption. Since the county’s fee to adopt an animal was only $90, taxpayers were losing money. Chestatee VCA charges the county $55 per animal. An appointment to the White County Board of Health to fulfill the remainder of a six-year term previously held by Emmett Shotts. Issues discussed during a work session are not generally voted on until the next county commission voting meeting.